It is often not realised that the Women’s Land Army – something very familiar for WW2 – actually was founded in the Great War. With war volunteers, and then conscription, the farming community rapidly found itself stripped of a workforce and from 1915 women began to take the place of the men in the fields. By 1917 a quarter of a million women were working on farms across Britain. 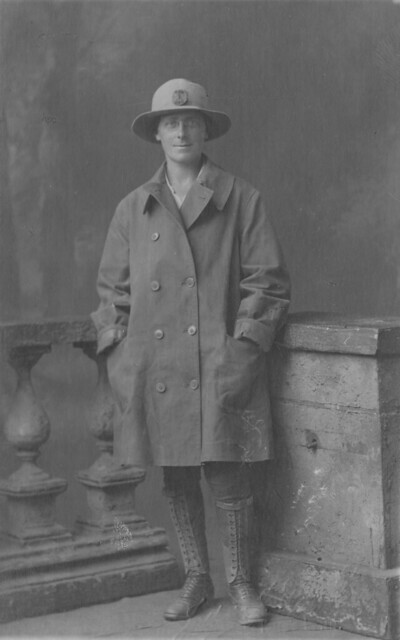 This unknown Woman’s Land Army worker wears a typical uniform of the period; a wide brimmed hat with the Women’s Land Army badge of the period, a rubberised waterproof jacket very similar to an army despatch riders coat, jodpers, good shoes and leather gaiters. It was very much practical and not stylish. Women like this did very important work in the Great War, now largely forgotten a century later and somewhat overshadowed by the more glamorous Land Girls of a later generation. This entry was posted on 15/02/2012 by sommecourt. It was filed under Great War, Home Front, Women in WW1, WW1 and was tagged with Great War, Home Front, Land Girls, Womens Land Army, WW1. I have a photograph of my Grandmother Nelly Evans (Nee Wright), in WW1 Women’s Land Army Uniform taken circa 1918. She was a Sergeant and was based at Moreton in Marsh, Glos, and later at Shab Hill, Birdlip, Glos UK. That’s all the details I have. How would I find out more? Wayne, if you don’t mind me butting in, have you got that photograph posted anywhere on the internet so we could see it? That would be wonderful, and a fantastic tribute to your grandmother and all her comrades! Thanks in advance, should you receive this message. I am hoping to find information about women of Bedford in WW1 and the part they played at work or at home .